Waterman's Paddle Jam is slated for a 9 a.m. start on Saturday, July 15. 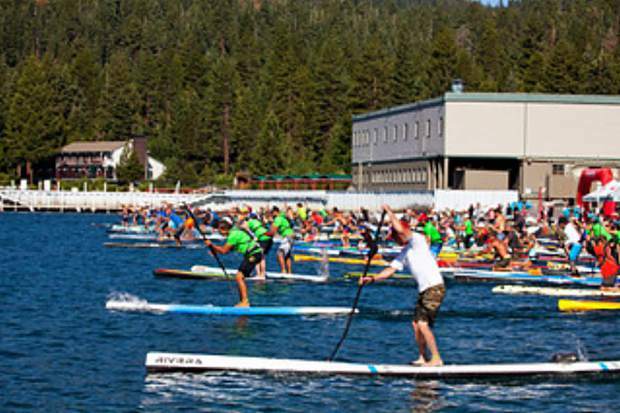 Hundreds of competitors will have the waters churning off of Carnelian Bay for the second round of the Lake Tahoe Paddleboard Association’s Tahoe Cup race. The Waterman’s Paddle Jam will take place on Saturday, July 15, and will feature a 6-mile loop starting and ending at Waterman’s Landing in Carnelian Bay. The race marks the second of the three-part series, and will begin at 9 a.m. The race will mark the third year Waterman’s Landing has hosted the event. Previously, Segal said the second round of the Tahoe Cup had been held at the Lake Tahoe Dam, but a lack of water in the area forced Segal to move the race elsewhere. “It used to be the Jam from the Dam, but we didn’t have any water for a few years,” Segal said. Following this year’s race, Waterman’s Landing will host the sixth annual Keike Challenge, a free stand-up and prone paddleboard race for children ages 1-11. Participants must provide their own equipment. There will also be free adult and children’s stand-up paddleboard demos available after the race. People can still sign up online for the race for $65, which includes a race jersey and lunch. Registration is also available on race day for $80. Currently Homewood’s Delila Quinn leads the women’s 12.6 Class with a win in the series opener, and Santa Cruz’s Sabine Dukes leads the women’s 14.0 Class. Estani Bori from Carnelian Bay leads the men’s 12.6 Class, and Truckee’s Jay Wild leads the men’s 14.0 Class. The series will conclude on Sept. 10 with the Tahoe Fall Classic. The event is a cross-lake race, covering the 22 miles from El Dorado Beach in South Lake to Mourelatos Lakeshore Resort in Tahoe Vista. Registration for the Tahoe Fall Classic event is currently open and costs $80. For more information or to register for races visit tahoecup.org.